33, of Pace, Florida; assigned to Naval Air Station Whiting Field near Milton, Florida; died April 28, 2013 in an automobile accident. Chief Robert “Bobby” Michael Paul Roy grew up in Lisbon with his parents Jane and Don Rivard, sister Ashley and brother Ricky. Chief Roy entered the Navy when he graduated from high school, after having participated in the U.S. Naval Sea Cadet Corps Program. Bobby loved being in the Navy and quickly became a leader and mentor to the sailors under his command. Chief Roy spent 13 of his nearly 16 years in the Navy on sea duty, serving primarily on aircraft carriers. Chief Roy was more proud of his Naval career than anything in his life until he married his wife Jessica and became a proud father to two sons, Christian and Brady. Bobby loved sports, the Dave Matthews Band, and playing the drums. He was an avid darts player, competing in tournaments and – even more competitively – against his brother and sister. His family remembers Bobby as a charmer, a protector, a loving brother and son, and a doting husband and father. To honor Robert, his family retrieved this stone in the spring of 2015 from the fire pit at the family camp in Lincoln, where Robert loved to sit and share stories with family and friends. Camp, dubbed “Club Lincoln” by Bobby and his siblings, is the last place the family was together before Robert’s death. 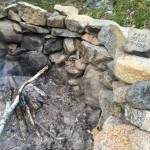 Robert’s father, Don, knew exactly where the stone should come from and he dug through three feet of snow covering the fire pit to find the perfect one. Bobby’s family wants those who carry his stone to know that he was a hero and that he loved Maine, even long after he moved out of the state. While marching with Don, he shared many stories of Robby with me. Robby was a force of nature. Loved by all with no true enemies. 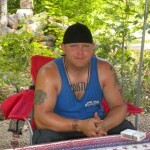 He had a love for pool, darts, motor cycles, camp, and many more past times. All of which he shared with both is mother and father. Robby left behind 2 children that he would bring to camp and congregate with loved ones, the water and just plain relaxing sitting by the fire. Sharing stories and ideas of “Club Lincoln” which was their camps nickname. Of the 16 years Robby served his country he spent 8 years married and grew his family to 2 sons. Robby’s generosity of heart was profound. He only saw his wife for 3 years of the 8. Robby would give up his leave time for others to exhaust and use in his stead. So they could go home, see their families, holidays, bereavement or vacations. He stood on the line to ensure fellow soldiers got to go home. This was a normalcy in Robby’s spirit. He was loving, charming, remarkable sense of humor and a leader. He always put others first before himself. Don shared with me the story of how he met Robby’s mother Jane. Very romantic at heart! I must say. Robby enjoyed his family and their company. I learned that some of his best friends were his guiders in life, both Jane and Don. It has been a privilege to learn of such a man and his beloved family. I value my own family and how camp brings our family together. The bonds of Robby and his family will live on forever in my spirits. Thank you Jane and Don for introducing Robby to me. I will never forget him. Thank you for walking with me( I walk slow) and listening to me. It was a hard emotional day. The first time I held and carried my sons stone, and it happened in the town the stone came from. 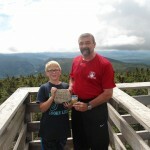 On July 4, 2015, I had the honor of carrying the tribute stone of Chief Robert “Bobby” Michael Paul Roy up Sentinel Mountain in Baxter State Park. After having spent significant time with Chief Roy’s family learning about his life and legacy, this hike was as much about honoring Bobby’s loving family, including his two playful sons, as it was about remembering Bobby himself. During the early part of the hike, I felt a bit distracted by thoughts of other things, some of them sad, but Bobby and his family were never far from my mind. I kept thinking about how if Bobby’s mother were there, she would wrap me in a bear hug, just like she had done to Bobby throughout his childhood. Other than his family, Bobby’s Navy service was perhaps the thing in his life he was most proud of (followed closely by any victories over his siblings in games of darts). He loved being a mentor to those under his command, and often took them under his wing if they needed a pep talk or someone who would listen and offer sage advice to a sailor who needed to talk. I felt joyful and a sense of freedom as I half-jogged down the mountain and thought how lucky I was to carry Bobby’s legacy. He was so special to so many people, and his loss hit the Navy community particularly hard. In honor of his service, shortly after Bobby died, an aircraft carrier loaded with sailors set out into the ocean not far from San Diego, where his Navy buddies launched a pair of Bobby’s boots off the carrier and into the sea. My personal sadness melted away as I thought of those boots somewhere in the bottom of the Pacific Ocean, representing a life of unwavering service, love of country, and dedication to his family. That legacy, and Bobby’s love of Maine, lives on through his stone, which lifted me out of my distractions and energized me on the mountain. And, through every Dave Matthews song I hear on the radio. I hope it brings his family some sense of comfort knowing Bobby’s stone will touch so many hands and hearts in the months and years to come, and that he will continue to inspire and energize others with every backpack that becomes its temporary home. To Bobby’s family, words can’t express how grateful I am that you let me into your home, into your hearts, and into your many wonderful memories of Bobby. Know that he is in my heart as well. 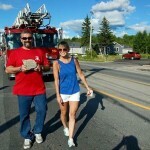 Thank you Kirsten for carrying Robs stone. Running with it must of hit your back hard. When I went to get the stone that was the one he pushed out of the snow to me from the fire pit. He should have pushed out a smaller one. I know this stone is not easy to get comfortable in your backpack but it is a reminder of him pushing you on and how he metored others on in the service. He loved the our great country and serving in the Navy. We would like to send you a bear hug. I would like to start off by thanking the Summit Project for making sure that Maine Heroes are not forgotten. While the stone was in my care I had the opportunity to make many memories. These memories I will cherish forever. Although a rock can never take the place of our son it is a physical symbolic memorial that helps fill the physical void of missing him. My first encounter with our son’s stone was in the town that it came from Lincoln Maine. Thanks to Jessica I got the opportunity to pick it up before the parade and bring it back to the family camp where I was able to take some very special photos. 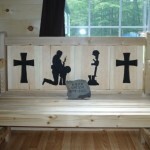 Some of those special places were with the memorial stone we painted, a quilt hanging on the wall that was made with some of my sons clothing and a veterans memorial bench. These were very special memento’s we had at camp to memorialize our son. Before leaving for the parade I placed the stone by the outside fire pit which is exactly where it came from as that was my son’s favorite place to be. I started a fire and just sat there and talked to my son. It was now time for the Lincoln parade so I headed down town. I was paired to walk next to Erin and enjoyed having the opportunity to tell her all about my son Robert. The parade ended at a local bank and the families were asked to speak about their heroes. I noticed many of the families had things written down and I had nothing and started to panic as I do not do well with public speaking. I turned around and a gentleman with the last name of Emery from Lee Maine said the best advice I could have received at that moment and that was to speak from the heart. It was finally my turn to tell everyone about my hero my son, I did the best that I could do I struggled at first choking up and letting the emotions get the best of me but at one point I feel that my son must of placed a guiding hand on my shoulder because it suddenly got easier and just flowed right out, I know I probably forgot a few things but I’m very confident that after I was done everyone in that room felt like they had known my son. The next adventure with the stone was at the run for the fallen event. This was the first time my family was able to see the stone and touch it. I could see the emotions running down their faces what an amazing day that honored our fallen heroes. We had the stone set up with us near the banner so all the runners could see it as they passed by. Another adventure was one of the main reasons I wanted to sign the stone out. I needed to hike with his stone up Old Speck Mountain with my oldest grandson Christian. The idea came to mind at the Gold Star family retreat we had seen a cabin named Old Speck I had explained to him about taking his dad up Old Speck and he couldn’t make it to the top we had to turn around. Christian looked right at me and said “pépère we will make it up” that was when I knew I had to take Christian on this hike. The day of the hike we had perfect weather. I took photos of Christian throughout the hike with his father’s stone. One of Christian’s favorites was at the exact spot his father turned around. We came across other hikers and told the story of why we were hiking with a rock and Rob’s story. Christian was on a mission to get to the top he was always out front of me stopping many times for me to catch up. I had Christian constantly yelling back at me and feeling Rob’s stone poking me in the back which at this moment I had wished we picked a smaller stone, together both were the best motivators anyone could ask for because we made it to the top. Once at the top the same hikers we met on our way up had waited for us so they could take our photos on the tower and we went into more details of the Summit project and again robs story. Maine heroes are not forgotten. I was so proud of my grandson the emotions were just going right through my body. On the way down we met more hikers and shared the story of Rob’s life, passion for serving his country in the Navy, and the purpose of the stone. 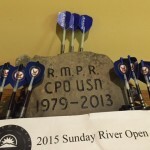 The next adventure was taking the stone to Sunday River for a dart tournament. My son was an avid dart player and was well known in the community for his darts. I carried the stone so proudly throughout the dart room and explained to everyone about the Summit project and my son’s story. At one point in the evening the entire room stopped what they were doing and we all gathered for a photo with the stone. 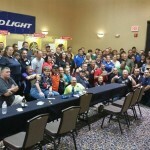 There were dart players from all over the US, Canada and even England. They were all touched by the story and it was emotional as a family to see everyone’s love and respect for Rob. The last adventure with Rob’s stone was a full circle back to camp in Lincoln with my wife. We were able to have more campfires for him and had the stone in our possession for our son’s birthday. It was harder than we thought but it was very meaningful to end our time back at camp where it all started. I wanted to end this with thanking the Summit Project once again for making sure that Maine heroes are not forgotten. I cannot even put into words the appreciation I have for what all the volunteers do to help us Gold Star families feel reassured that our Hero will not be forgotten. My son’s story will always be told and it will forever live on with the multiple hikes it will take. 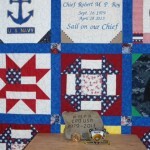 Although like I said earlier I would much rather have my son versus a stone but the stone at least has a story behind it and everyone will learn how dedicated Rob was to his career as a Chief in the Navy and how much he loved his family and friends. On Friday, October 16th, 2015 I carried the stone and story of CPO Robert Michael Paul Roy up Cadillac Mountain in Acadia National Park. We were a part of a four-hero, five-hiker team taking on a non-hosted hike of the South Ridge Trail. 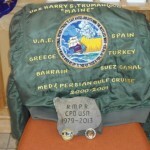 My physical journey with Bobby began on Thursday night when I first touched his stone at MEPS in Portland, ME – but I have carried something of his story since TSP at BSP 2015 when I first met Don Rivard. Bobby’s stone was not yet engraved at that point, but Don shared a little of Bobby’s story with me. Seeing the love and pride that was so evident when he spoke of Bobby, I knew that I needed to learn Bobby’s story and carry his stone. For our hike, Bobby would be accompanied by SPC Dustin J Harris, PFC Buddy W McLain, and SO1 Patrick D Feeks. As I left Portland and headed north, I felt like this was by far one of the safest road trips I would ever take on with four guardian angels riding with me. After spending a night in Millinocket, the stones made the trip to the coast with Mike Winslow and me. 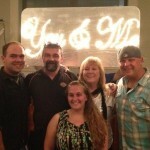 We were to meet up with Kirsten (Boots) White and Jonathan Kelley to complete our team. I remember thinking on the way to Acadia that we were in for a cold, rainy, and windy hike. It was raining much of the drive down, and as we reached Thompson’s Island for a brief check-in with Mama Bear – the rain picked up a little more. We quickly donned our rain gear, but as we waited for the rest of our hiking team, the weather started to clear. Somehow even with the weather report calling for 50%+ chance of rain on Friday afternoon – we were being blessed with perfect hiking weather. The clouds cleared and the sun started shining – ironically enough, right about the time that Boots arrived. I like to think that Bobby had a hand in that somehow. We started our hike much later than we originally intended, but with the morning weather at Acadia – we had the trail almost entirely to ourselves. It also allowed for Mike Peterson to join us on our hike, bringing our team up to five. We were able to take our time, share stories of what we had learned, and stop for photos with Bobby, Buddy, Dustin, and Patrick. Having Mike Peterson with us that day was a blessing because it allowed us to share our journey with their families. One of my favorite photos from that day was taken of the stones placed around the summit marker with each of us standing with the stone we carried. TSP Stones and hiking boots – to me it symbolized the journey of each hero that created each story we carried and led to our own journey up the mountain. It made me think of the impact Bobby’s journey made on the Naval Community, which inspired a legion of Navy personnel to launch his boots off the aircraft carrier in his memory. Given that our hike took place one day before TSP at ANP 2015, I was fortunate enough to meet Bobby’s family at Thompson’s Island. There were a lot of people there, and our time was short. But Bobby was far from finished playing his hand that weekend. Mike and I were on our way to the Hutchins’ for a small post-event meal, and who should we find next-door but the Rivard family. We were fortunate enough to spend time with them that night sharing a home-cooked meal, listening to Dave Matthews Band, and getting to know them as well as Bobby. Don and Ashley spoke not only of his strength of character, but of his physical strength and how fitting it was that Bobby chose a hefty stone that would add some significant weight to a pack. Bobby was a hero who loved and protected those around him. He loved his country, and he loved Maine. I heard all of these things and more from a family that loved him as much in return. The heroes we honor were amazing men and women, and that doesn’t happen by chance. I feel honored to have met and experienced a little bit of what molded Bobby into the man that he became. Thank you to the Rivards for sharing Bobby’s story with us, and thank you for sharing a bit of yourselves, as well. In my experience, one of the great things about The Summit Project’s mission is that each person that is drawn to it connects with the mission on a very personal level in a unique way. For me, the mission has always been about connecting with our fallen heroes on a personal level. We know how they were lost, but I always strive to focus on how they lived. From what I know of Bobby’s life, it seems clear that family was very important to him whether that was his family at home or his military family. I am proud to call each of the hikers I joined on Friday “family”, honored beyond measure each time my “family” grows bigger, and to be able to share Bobby’s memory with them (and learn more about Bobby from Boots and the Rivards) was something I will never forget. 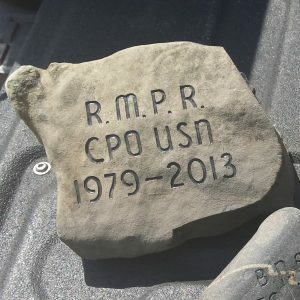 On Saturday, October 17th 2015, I spent the day carrying the stone and story of CPO Robert Michael Paul Roy up Cadillac Mountain with TSP at ANP. After weeks of prep and learning more about Bobby, I wanted to make sure my hike was centered around remembrance and family. The day started out with a beautiful sunrise that I watched over water, as we took a moment before the hike to gather together with stones in hand. On our way up, the weather was rainy but as we peaked thru the forest cover, we found a beautiful rainbow – how fitting for a day of remembrance. These were some of my favorite captured moments. This had been my first hike up the mountain and with each step, by the weight of his stone and the rainbow that seemingly hovered over us in the pictures I thought of Bobby and his family. At the top, our team gathered together for a summit ceremony to share the story behind the stone and how we can apply their character and all they stood for, to our daily lives. I started off with how Bobby’s stone was chosen – from their family camp where the family last spent their precious moments with Bobby. His dad knew it needed to come from the fire pit – a big stone fitting for Bobby. Bobby’s devotion to his country and the love for his family are what stood out to me – as a CPO in the Navy his commitment thru the 16 years of service impressed many around him, while his love for his family left beautiful memories. Dedication and Love – those characteristics will be something I strive to embody each day, thanks to Bobby. As I shared these with my team, I looked at the stone my husband carried – “FAMILY” – knowing that once we left there we would be going to Thompson ‘ s Island for the Stone Ceremony where I would meet Bobby’s family for the first time. Once we arrived at Thompson’s Island, we immediately lined up for the Stone Ceremony. The moment I called out Bobby’s stone and walked to his family was incredibly profound. We hugged, we cried, and then we hugged some more. Afterward I learned even more about Bobby, from his musical love to hearing about how he mentored so many. Don, Bobby’s dad, shared his memory of hiking Old Speck with Bobby’s son, carrying Bobby’s stone with them. They were ALL able to summit Old Speck, Together. Ashley, Bobby’s sister, shared how during his naval career, he loved to mentor those and built strong relationships to the point where, even after his passing he was remembered by those he served with by flying his boots out to sea. You see, Bobby was known to leave items behind. In his old locker, they found his boots. How wonderful to send him out to a place he loved to be. To Bobby’s family- I am so grateful for meeting all of you and sharing your memories with me. Words can’t express how thankful I am to know Bobby’s story and the memory of this day and his stone will forever stay with me. Love you ALL! The mission of The Summit Project brings a connection to so many thru the remembrance of Maine’s fallen hero’s to ensure that Maine’s Hero’s Are NOT Forgotten. This brings about a family that will never be separated but instead continue to growth thru pride, strength, love and always commemoration to those dedicated their lives to protecting our country and freedom. Do to some computor problems I am now able to reply. It was a very special day for our family at Acadia. Your beaming smile on your face was full of pride and honor as you walked to the middle and announced about carrying the stone and story of CPO Robert Roy. It was the same type of smile Rob had when he talked about his duties in the Navy and his family. It was also fitting that your husband was carrying the family stone. Welcome to the TSP family and our family. Thank you for taking the time to get to know our son. MHANF. I would like to say I didn’t know Robert Roy personally, but when the Summit Project came to Boothbay Maine, I was excited to know who and what this amazing person did. I enjoyed reading about him and all he accomplished. I carried his stone all throughout Boothbay and read a paper I wrote based on the information I read about him. I loved the dedication it took just to get the stone for him. We pushed through rain and wind to carry these stones which I personally didn’t mind because it was for a good cause. I’m sorry for your loss he was an amazing man and I loved reading and carrying his stone for this project. I’d love to read and learn more about him in anyway possible. Again I’m so sorry for your loss and he was such a fun person to read about. Thank you for sharing his story for not just me but others to read about. This project and his story got me thinking more about Veterans Day and what it really means to me and my community. Also how Veterans Day isn’t a one day thing it’s really everyday because everyday we lose loved ones and everyday we should thank a veteran. So thank you so much for his story! Thank you so much for the extra information! I will defiantly look for that video, becuase it warms my heart seeing parents surprise their kids like that. Also you’re very welcome I really enjoyed reading about him. I love all his because I come from a long line of servicemen and I just love everything they do. Especially your son. Again thank you for more of him and his life I really appreciate it. I Had the honor of carrying Robert Michael Paul Roy up Big Moose mountain for the summit project. As we started the climb up Big Moose it started out easy than it started to get a little harder before we got to the camp the views were amazing I took lots of pictures on the way up it was nice. After we got to the camp the trails got harder they got steeper as they got steeper I thought about Robert when I got to the steep part because he liked competing against others so I made sure I was the first one in my group to reach the top and I pushed my group to move faster but not to hard as we got to the top the view was amazing just looking down it was beautiful you could see the roads houses and the lakes after we talked about all the other people that served in the military we all ran down the mountain. The group I was in was the first one down and it took us 37 minutes to get down. I learned a lot about Robert as I was reading about him I learned that he was a great son and father. He loved sports and played in the dave matthews band he played the drums he also played in dart tournaments he was competitive. I also know that his family remembers him as a charmer and a protector. I also know that he served 16 years of those 16 years he served 13 out at sea he was mostly on aircraft carriers. I was honored to carry Robert Michael Paul Roy stone up Big Moose Mountain. Hiking on June 7th is a reminder to me of where my dad was on this date back in 1944 in France. To hike with his stone which is not a small one. To be the first one up the mountain is something Rob would have tried to do. Thank you for taking time to learn the story of our son and the TSP program. Don and Jane, Jessica, Ashley, Ricky, Christian and Brady: On Wednesday August 24th, I had a day off and hiked with a friend up Black Mountain in the Downeast Maine region between Aurora and Winter Harbor. I didn’t have Robbie’s stone with me but throughout the hike his image kept coming to the front of my mind. When we got to the top and I looked out at the view, it was of Tunk Lake with the ocean beyond. Of course, many types of boats were floating in the ocean and again my thoughts came to Robbie and the time he spent at sea, doing service for this country, making sure his men and women had time off with their families while he stayed on board. I shared his story with my friend and also the story of meeting you all at BSP 2016, and the impact it had on me as I saw your strength and love for each other. I felt Robbie’s presence very strongly on that hike. I want you to know that he will NEVER be forgotten. My name is Ashley Rivard from Lewiston Maine. On Saturday October 1, 2016 I had the distinct privilege and honor to carry my brother CPO Robert Roys story and stone to the summit of Cadillac mountain In Acadia along with Team Kebo. I thought I was going Into this hike with a mental advantage because I was raised with my hero but I soon realized as the day approached it was more of a disadvantage and came to be more of a personal challenge. My biggest fear was making sure I was honoring my brother to the best of my ability. The night approached before my hike and I could not sleep I did not want to let my brother down. I finally was able to doze off and get a couple hours of sleep only to be awaken by my alarm which was the song ants marching by Dave Matthews band. This was it today was the day I had been waiting for since Memorial Weekend TSP at BSP when I made the courageous decision I was hiking with my brothers stone. I arrived super early which is not my normal habit and instantly the tears started to flow. The time came when I was able to take ownership of his stone and place it in my pack. I brought one of his work shirts to wrap it in to help smooth the edges. My pack was packed and I knew I was in for a challenge as that pack was physically heavy with very little in it but his stone. Which represented the daily weight we all carry in our hearts of his loss. What I was about to do still had not mentally sunk in yet even on the bus ride to our trail. It wasn’t until I took that first official step in the trail that it really hit me there was no going back even if I wanted to. It was great to share stories of different memories throughout the hike of my brother and how it was growing up with him. I caught myself speaking up about random cherished memories or old habits of his personality quite often. I thought before this hike I would have this magical moment where the stones physical weight would out weigh the weight of his loss in my heart. That magical moment never happened but I did get a moment of clarity during the stone ceremony at the summit. As we neared the summit it really sunk in that I was about to finish out the most honorable thing I could possibly do in my brothers memory. My brother’s courage and strength helped me complete the day’s task with little to no issues. I made it to the top with the most fulfilled feeling in my heart that I have ever felt. During the most breathtaking emotional stone ceremony with my team I saw the complete big picture and everything come together for the mission at hand. I tried for weeks leading up to this moment to write down what I wanted to say about Chief Robert Roy and I could never put anything to paper so I just spoke from the heart. My brother’s big hearted, mentor personality and strength made it very easy to speak about his career in the navy and his family. What I hope others took from my heroes story is to always live life to the fullest, never take anything for granted, if you work hard you can achieve anything. My hero strived for the best in his career and to make his boys proud but what came naturally to him was to give lectures and talk to anyone when they were down and allow them to see the light and stick with the task at hand and not quit. I have heard so many stories from his shipmates throughout his career that if it wasn’t for Chief Roy they would have gotten out of the Navy and wouldn’t be where they are in life. My brother’s legacy lives on everyday in each person that had the privilege to call him a friend, shipmate, or family member and I am 100% positive on that. On the bus ride back to base camp I kept my eyes closed for some time just taking it all in and channeling my brother’s strength to get me through another hard moment. I had to face my family from the opposite side of the circle I am use to being next to them in. It was my time to announce the name of the stone and story I carried that day and hand over my brothers stone to my parents. 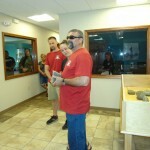 At that exact moment where my mother accepted her son’s stone and my dad presented me with my patch I knew I carried out the mission just like my brother would have done. I laughed, I cried, I had an overwhelming feeling of pride. To put into words everything that I got out of that day on the mountain with my brothers stone can still not fully be completed. I want to thank the summit project for giving me the opportunity to share my brother’s stone and story with a great group of people, also for ensuring that our heroes are not forgotten. I also want to thank my family for being the biggest support system anyone could have, this family is not all biological this is the entire gold star family and all the volunteers that have helped in any way possible. How do I reply to your letter Ashley. This was a day of being proud of my daughter a sad for the loss of our son. I do not have to tell you about Rob for you grew up with him and know him. To see you leave the hotel early that morning brought pride and tears to my eyes. Waiting to be picked up by mom and Matt to go to the campground was very long but not as long as being at the campground waiting for the first sight of you. Then to see you walk out with Robs stone and say your little piece of carrying the story and stone of my brother CPO Robert M P Roy started the tear flowing again. Then to walk to each other and see mom receive the stone and the hug she gave you, good thing my sunglasses hid my tears. Now it was my turn to hug you and give you the patch. I was over flowing with pride of what you had done. Knowing how nervous you were before this hike. To see the I DID IT look on your face was priceless. I know it was not easy for you but I am proud of you and love you for how you handled yourself leading up to the hike and was very proud to receive the stone from you. Rob is also proud of you for telling his story. We love you Tipples Job well done. Beautiful essay, Ashley. I have been honored to get to know you, Bobby and the rest of your family through TSP. I’m so sorry for your loss. Thank you for sharing your brother with others. I want to thank your family for the opportunity to carry Rob’s stone during the Honor Case march in Bangor on September 12, 2016. I was asked to carry his stone for one reason – I asked to carry a fellow Navy shipmate. That was my only request . Little did I know what a great shipmate I would be honoring! Talking with his sister Ashley prior to the march about his career, his love for darts, tattoos, his boys – the stories and videos and pictures just flowed – laughs and tears and just total admiration for this man. I told Ashley how he just was bigger than life – he lived what he taught and instilled in his sailors he mentored. I loved the story and video of surprising his children at baseball, how the Dave Matthews Band was his all time favorite and how his favorite food included anything with salt and McDonalds. The video of his boots being launched from the flight deck was more emotional than I expected. I was so reminded of many people I served with and the pride and love his sister has just oozed from every word she typed. The day of the march was the most beautiful fall day – a quick walk across town, and there was his dad – a huge American flag held high and proud. Placing his stone in the honor case, I walked back across the atrium, only to get the biggest embrace from Don, like we had known one another for years. We chatted for quite a bit after, and I felt so honored to be able to see “club Lincoln” and the exact spot the stone was retrieved from that winter’s day. Despite the short period of time I had to spend with Chief Roy’s stone and discuss his life with his family – there is a bond now that will carry on forever. Thank you all for allowing me the honor to continue to keep his memory alive and for sharing your lives with me. Chief Roy’s legacy, love for his country and family will be told again and again, as long as I walk this earth. Jackie it was very nice to meet you in Bangor. To have a fellow Navy shipmate carry his stone was a honor for our family. You are part of our family now and always will be. Hope to see you at another TSP function for sure. I Don Rivard carried the stone and story of my son ABE Chief Roy to the NAS Whiting Field Base in Florida. This trip was tough on the heart and mind for sure. This is the area that we had him taken away from us 4 years ago. I told the story of our son every chance I could along my travels at the airports and on the planes. Whiting Field was holding their first ever run for the fallen and Rob (Bobby) was on the top of their list for this run. The morning of the run I sat in my room with the stone out and asked Rob to help me get through the day. When I got to the run I took the stone out of the bag and I began to talk to people about my son and the Summit Project honor stone. This event was on the base so it was not open to the public just those that were active or retired military or dependents. I found chiefs that served with him on the different aircraft carriers two being the USS Harry S.Truman and the USS Carl Vinson. I explained to them where the stone came from and how it was retrieved. The commander of the base also came over to talk to me. It was overwhelming for me to take it all in. The commander got up to speak to everyone before the race started and talked about my son. It was very clear he had taken the time to learn about Rob’s whole story from the very beginning at Sea Cadets all the way to his short time at the Whiting Field base. He did not leave anything out he even talked about his wife, kids, siblings and his parents. This was very stunning to me and I teared up. After he was done they asked me to get up and talk. It was extremely hard to follow the commander but I spoke from the heart and knew my son was with me that day. Thankfully I had a chief on each side of me holding me up. I thanked all of them from my wife and I with tears rolling down my cheeks under my sunglasses. I noticed when I was done many others had tears in their eyes as well. During the run his stone was carried by more than one person. It was passed on from Sailors to Chiefs and finished with a Marine carrying it across the finish line. Many of these people did not know my son personally but was honored to carry the stone along their run. I only have good things to say about the way he was honored that day and continues to be. The way he affected other sailors during his naval career was very prominent by the way he was talked about. He is still affecting others to this day, well beyond his time. After the race was complete we headed over to the Veterans memorial park in Milton where Rob has a brick placed with his name and dates on it. The Chiefs took a photo by his brick holding his TSP stone. Navy Chiefs and Navy pride was shown to me and it was overwhelming again. NAS Whiting Field was amazing to my son and I. Like any other Gold Star family who lost a son, daughter, brother, sister, husband or father we would love to have not lost them but the way their memory is kept alive with the Summit Project does help for sure. MHANF and all of our heroes are not forgotten. Thank you to NAS Whiting Field for honoring my son and 61 others that day. On May 28th 2017, Memorial Day weekend, I had the honor, privilege, and plain old good luck of carrying the stone and story of Navy CPO Robert MP Roy up the Abol Trail of Mt Katahdin with ten energetic, committed, and good-humored TSP hikers. I say good luck because I don’t come from a military background, I am not from Maine, and I was apprehensive that I might not be able to relate well to the soldier, the story, or even the family of the fallen hero whose stone I was to carry. But then I received a warm and engaging email from Robert’s sister Ashley Rivard, I did some reading about him, and a bond began to form. This is the most amazing aspect of the Summit Project for us hikers – we really do take part of the hero up those rocky trails with us, even if we’ve never met them. I met the Roy & Rivard family on Saturday at the NEOC stone arrival ceremony, and they were every bit as wonderful and encouraging as I had heard and hoped. They were staying the weekend in Lincoln at the family campground, where Robert’s stone had been chosen from the fire pit. His dad told me the stone fell out of the ring on its own, so apparently Robert himself did the choosing! It was becoming clear to me that I was to carry the stone of someone very well loved, and I felt lucky and proud to be doing so. We tried to get to bed early for an early start; the weather looked favorable, the trail was dry, and during the night, Northern Maine was treated to one of the best aurora displays in a long time. God was enthusiastically on our side! I love to hike, and at breakfast in the rec center when I packed Robert’s stone – it’s a “sizable” stone – I was more and more aware that this was going to be a different kind of day on the mountain, with a higher purpose. 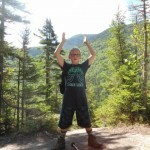 We had a beautiful hike up Katahdin; I had never been there and every step was an adventure. It was also very steep almost from the start, very bouldery, and intimidating at times as we pulled ourselves and each other up the rockfalls, like ants marching together on a mission. I already knew Bobby, with whom I was now becoming more familiar, was like me a big DMB fan, so I had listened to some blast from the past songs in the previous days, and on the flights to Maine. So while I had a few songs in the back of my head at the start of the day, by the end of the day there was only ONE: “Crash Into Me”. The way I had packed the stone meant it was secure in the bottom of my pack as we started, but as I drank more water, there was more space, and it began to bounce around a bit. I have a strong back (I’m an ICU nurse) so absolutely no harm was done, but many, many times I felt Bobby’s chosen stone reminding me why I was on this hike that day, and DM’s voice would fill my brain. And of course I smiled. Like I said, it was a beautiful hike. At the summit, we brought out the stones and took a great many pictures, and shared why we were there with some fellow hikers. I told a couple from Michigan about Bobby and how he had chosen his own stone, and about DMB’s role in keeping my feet climbing steadily up those rockfalls. I also took a few minutes and walked away from the summit crowd and thought about the man whose memory I had climbed with. And as I looked out on the vast green horizons of northern Maine I considered the even vaster ocean horizons he must have seen, thousands of times, over 16 years in the Navy; the space between him and the ones he loved so much; DMB again. We held the remembrance ceremony down at the trailhead, all of us exhausted in a number of ways. But as our turn would come to speak, we each lightened up and grew excited to share with our mates just whom we had carried with us that day. I was especially proud that I had carried Bobby’s stone for a family I thought so much of, and for a sailor I now thought so much of. Back at NEOC an hour later, Bobby’s family and I once again exchanged the stone they had entrusted to me for the day, in an almost golden sunset. I will remember their faces and their smiles — warm, encouraging, just a little sad, but strong and steady and full of love, for a very long time. To the Roy & Rivard family, thank you very much for letting me be a part of Bobby’s Memorial Day 2017. It was an honor and a pleasure. Nope — the stone is PERFECT — I wouldn’t change a thing ! It was an honor and a pleasure. and I hope to see you all again in October. I would like to personally thank you for sharing Robert and his life with us and others who take part in this amazing program. On Sunday, September 24, 2017, I had the honor of carrying the stone of Navy CPO Robert (“Bobby”) Michael Paul Roy to the summit of Mt. Blue. It was a beautiful, unusually warm early fall day, and I awoke a bit groggy after celebrating the wedding of Bobby’s sister, Ashley Rivard Faucher, to Andrew Faucher, the evening before. But, once I laid eyes on Bobby’s stone, I felt energized and hit the road for my solo hike. The leaves were beginning to turn, and the drive was peaceful – the back roads to Weld dotted with red and yellow foliage. I put all my windows down and turned up the radio, grinning and singing along as Bobby’s favorite – Dave Matthews – streamed from the stereo. As I pulled into the parking lot at the trail head, I noticed the NAVY bumper sticker on one of the three cars that had beaten me to the mountain. Another sign from Bobby, I was sure. I wrapped his stone in a fleece and carefully placed it in the bottom of my pack, put on my headphones, and hit the trail. I was grateful for some time alone with this stone – lovingly selected by Don from the fire pit at the family camp in Lincoln, where Bobby loved to spend time playing darts with his siblings and relaxing with the family. As I hiked, I marveled at the priceless connection Bobby seemed to have facilitated between me and his family. 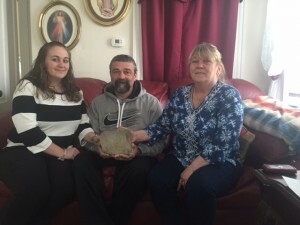 In May 2015, I walked into their home to collect the stone from Don and Janey, and to learn about Bobby so we could upload some personal content to his “honored” page on the TSP website. What we all anticipated would be at most a 1-hour visit turned into a 3-hour bonding session – and Bobby’s family has been my family ever since. In fact, the day before, Ashley and Andrew had given me the great honor of officiating their wedding. I believe Bobby – a loving and protective older brother – would have been so proud of Ashley on her wedding day, and equally proud of his two handsome sons who stole the show as ring “security” at the ceremony. I also thought about the kind of leader Bobby was in the Navy, and the example he set for others. Janey had told me several stories about the pride he took in his Navy career, and those he mentored during his 16 years of service. I thought about the love he had for his family – and how loyalty to them and the Navy had become a strong theme in the way I talked about Bobby to others. Finally, I thought about his love of Maine, and how he and my hikes with other stones representing Maine’s fallen heroes reintroduced me to my home state, bringing me home again after many years living out of state. It was with that sense of gratitude that I reached the summit and encountered a gorgeous view of the Maine landscape below a cloudless blue sky. There was a group of hikers who summited ahead of me still at the peak when I reached the top. I asked them if one of them was the owner of the car with the NAVY bumper sticker I had seen at the trail head. As it turned out, several people in the group had Navy and other military connections, so I pulled out Bobby’s stone and passed it around to the group, every member of which hung on every word as I recounted stories about Bobby shared with me by Janey and the rest of his family. Another chance encounter with kind strangers brought together because of the memories of Maine’s fallen. As I descended the mountain shortly thereafter, another Dave Matthews song lit up my headphones, and I grinned again, grateful for Bobby, his family, and this beautiful day in the Maine woods. I love you guys like I love my own family. Thank you for welcoming me into yours. Just before arriving to base camp of TSP ANP, one of our team members fell ill and I was presented with the opportunity to carry the story and stone of CPO Roy to the summit of Cadillac Mountain. I humbly accepted the privilege. While researching his story, I was immediately struck by his clear and obvious sense of service to others and his dedication to his family. Hearing the story of his family identifying the stone they would dedicate to him from their family camp, and his father’s retrieving it by digging through 3feet of snow, highlighted from where his passion for commitment possibly came from. CPO Roy was always willing to put others before himself, provide mentorship to those looking for council, or offer a few words of encouragement. Early on, he learned how it felt to be wrapped in a bear hug from his mother and family, and his dedication to his fellows was perhaps another way for him to pass on that feeling. A huge fan of bear hugs and a dedicated family member myself, I will continue to spread the feeling of community and service in CPO Roy’s honor. I want to thank you all for Bobby’s service for our country. I was honored to have the opportunity to carry Bobby’s stone for The Summit Project hike in Baxter State Park over Memorial Day weekend. This weekend event has redefined the meaning of Memorial Day for me, as I am sure it has for others who have got an opportunity to learn about Gold Star families who have lost a loved one while in the service of our country. Prior to learning about this event last year and hiking for my first time, I spent time on Memorial Day with family and friends and maybe go to a Memorial Day parade and then BBQ. I have always been proud to be an American and proud of our service members in the military and their sacrifices as well as the families and friends, but I don’t think that perspective is the same until you meet a Gold Star family and hear about the loss of someone so close to them. It becomes much more real and personal and you want to do whatever you can to thank them for the ultimate sacrifice that was made in an effort to protect our ability to enjoy the gift of life and freedom. Nothing that can be comparable to the loss of your loved one or any others, just a deeper respect and understanding about the true meaning of Memorial Day and why not spend that time remembering those lives that mean so much and should never be forgotten. Getting to know Bobby was a privilege I did not have in person. I was honored to get to read about his life and get some insight from Ashley on what Bobby did and would want to be remembered for. 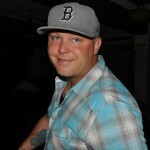 It was very obvious that Bobby lived life to the fullest and had a blast doing it and was going to be missed by many. I felt a connection to Bobby in the way that I know he was a great dad and husband, some of the things that he truly loved more than his job. Being a merchant mariner, I would spend time on ships and leaving the family was always the toughest part of the job and reading through some past posts on Bobby’s Facebook page, I could sense the feeling of just wanting to be home with his family and that nothing was more important. This year for the TSP hike I ended up going alone as my wife and 2 girls couldn’t make the trip this year. The drive from Portland was a quiet and peaceful drive that gave me an opportunity to think about the weekend and the hike where I would be carrying Bobby’s Stone and story. That evening after arriving at the campground after dinner I got a chance to receive Bobby’s stone. It is a pretty good size stone and laughed at myself for slacking off and not getting in better shape for the hike. Great to see familiar faces and the turnout to support this event, very motivating. The next morning was a beautiful day for the hike and I carried Bobby’s stone in my arms for as long as I could – I had a pretty low level of confidence that my old backpack would support the weight of Bobby’s stone, but it did! I laughed a bit along the way thinking that Bobby most likely would be laughing at me huffing and puffing up the mountain, but I had a good feeling that he was motivating me along with the thought of enjoying a cold beer after. I was fortunate to have a great team of people to hike with and share the stories with. I don’t know if I did Bobby justice in telling his story but know his story will keep being told and he will not be forgotten. I hope that I get a chance to know Bobby better through more memories of him from his family and friends. Thank you! Oh Bobby where do I begin. The morning of the hike on September 29th was beautiful. Cool, crisp, and we knew it was going to be a good day. Now I was not assigned Bobby’s stone originally, however he found me only a few days before the hike. So I had my work cut out for me. I hoped that I was going to do not only Bobby, but his family proud. Not only was Bobby’s stone heavy, but pointy!! 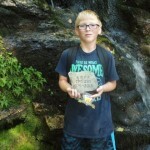 Bobby knew which stone he wanted his father to find when he dug it out of hip deep snow at the family camp! Stone size and weight aside, the messages from Ashley helped me to form a better picture of who Bobby was. I was and will be forever grateful for that. I had a another officer Jordan Brochu in my pack as well, so the morning of the hike I had forgotten a few things at the cabin and walked back to gather them. I had a chat with both the guys. Asking them to keep me and my team safe and on the correct path for the day. Packing my pack I was thankful for the padded stone sac that I had been given that morning. On the hike I had a bit of a incident happen. I was having knee problems and came up to a spot where I had to literally climb over this rock ledge. I did it! But then I started to fall backwards, “oh no I’m going over.” is what I was thinking. About that time I felt two hands on my back give me a push forward. “THANKS! !” I said, no response. I looked back to see nobody there, the closest member of my team was about 40 ft behind me. I patted my pack and said ‘Thanks guys!’ and continued to climb. I have no doubt in my mind that the two men that I carried that day were there with me. Probably laughing at me! I could tell from the messages from Ashley, that he was loved, missed, and thought of often. I had come across in my research, fellow crew members after he passed, had a pair of his boot launched overboard of the coast of San Diego. Ashley told me yes that in fact happened. That was their way of paying respects to the brother they had lost. Everyone that met him thought the world of him. His boys are going to grow up knowing that their dad is a hero. He served this country with pride! OK this is just to weird!! Dave Matthews Band is playing on the radio right now as I type this! Ants Marching! I truly believe that I was given to honor of carrying his stone and story up Cadillac mountain that day, and that he was with me and clearly still is to this day! Thank you to the Rivard family for chatting with me that day, we will always be connected now. Don I hope you had a nice ride back with Bobby’s stone in your saddlebag! MHANF!! Thank you for taking the time to get to know our hero on such short notice. You will forever be held in a special place of our hearts. We are reminded that because of people like yourself my brother our rock of a sibling will never be forgotten. Bobby always had a way to motivate anyone in their time of need and support them so I have no doubt in my mind one of those hands you felt was his helping you stay upright. I was truly touched to see the photo you took that you had a Mt. Dew and a package of salted peanuts in your pack for him. His stone is large but it definitely reflects the personality he had along with the big impact he had on anyone who was blessed to get to know him. Ants Marching by DMB is another wonderful sign that you were truly meant to carry his stone and story this year. On behalf of my parents, my brother, my sister in law and nephews we all thank you for taking on the challenge and never looking back about it. You embraced the signs he gave and also you were easy going about it which is something he would have been as well. Thank you for all you do with helping make sure our Maine Heroes are Never Forgotten.